Thanks to Mr Mashad A Almajeri for supplying information on a number of Kuwait items, and to Jay Hickey for his images of the Free Kuwait labels. 1995 (earliest recorded usage). Arms of Kuwait. Inscribed AUTHORITIES in English at left. 21½ x 27 mm. Perf 14½ x 14. Arabic text watermark (sideways). Arms multicoloured, frame in gold, inscriptions in black. Background colours given. ​Earliest recorded usage: July 1995 (A4). 1964 (earliest recorded usage). Arms of Kuwait in ornate frame. 25½ x 21 mm. Perf 15 x 14. No watermark. Arms and inscriptions in black. 1971 (earliest recorded usage). Palestinian propaganda labels depicting armed fighters in Arab headdress. Inscribed Kuwait at top in Arabic. 22 x 36 mm (5f to 50f), 100f taller. Perf 13½. No watermark. Multicoloured; frame colours given. 1991. Arms and Flag of Kuwait. Inscribed Free Kuwait in Arabic at top and in English at foot. Multicoloured. c1985 (according to Barefoot). Arms of Kuwait. Inscribed MINISTRIES in English at left. 21½ x 27 mm. Perf 14½ x 14. Arabic text watermark (sideways). Arms multicoloured, frame in gold, inscriptions in black. Background colours given. 1992 (earliest recorded usage). Arms of Kuwait (multicoloured) in green frame, with inscriptions in green and red. Similar to Revenue issue of 1982 but different size (21 x 28 mm) and additionally inscribed MINISTRIES in Arabic at left. Perf 13½. No watermark. Background colour (given below) extends into the margins. Note: for a similar design without Arabic inscription at left, see Revenue R22ff below. 1954 (earliest recorded usage). Sheikh Ahmad Al-Jaber Al-Sabah (sheikh of Kuwait 1921-1950). 25 x 35½ mm. Perf 11½. No watermark. Arabic inscription Financial Fee in lower panel in second colour given. 1977 (see footnote). New issue in decimal currency (fils and dinars). Oil wells and palm trees. Value in black. Background of fine mesh in second colour listed. Fils values 21½ x 31½ mm, perf 12 x 12½. Dinar values 26½ x 36½ mm, perf 13½ x 14. Grid-pattern (half check) watermark. 1982 (earliest recorded usage). Arms of Kuwait (multicoloured) in green frame, with inscriptions in green and red. 20½ x 25½ mm (fils values) or 23½ x 35 mm (dinar values). Perf 12. Arabic script watermark waraaqa maaliah (=financial paper). Dinar values printed in sheets of 50 (5 rows of 10). Background colour (given below) extends into the margins. For a similar design with an additional Arabic inscription at left, see Ministries M13/14 above. ​1. A correspondent has informed me that this issue was printed by Harrison & Sons. 2. Earliest recorded usage: July 1995 (R33). 1999 (earliest recorded usage). Kuwait Towers, with tallest tower at left. 25 x 36 mm. Imperf with deckled edges. No watermark. Self-adhesive. Straight-line security underprint of REVENUE in English and Arabic. Arms in hologram, value in black. Unique security number in grey-black printed by dot matrix at foot of stamp - prefixed A (250f), B (500f), C (1d), D (2d), E (5d) or F (10d). The 1d prefixed K and the 10d prefixed G are probably from later printings. The earliest recorded usage of the 10d G is February 2004. 2002 (earliest recorded usage). Kuwait Towers, with tallest tower at right. 25 x 36 mm. Imperf with deckled edges. No watermark. Self-adhesive. Wavy-line security underprint of KUWAIT REVENUE in English and Arabic. Arms in hologram, value in black. Unique security number in black at foot of stamp - prefixed A (250f), B (500f), C (1d), D (2d), E (5d) or F (10d). 2008 (earliest recorded usage). Stylised map of Kuwait. No watermark. Self-adhesive. Fluorescent band at left with repeated letters SK (= State of Kuwait) reading downwards. Arms in hologram, map and inscriptions in black, security pattern in olive-green. Background colour given. Unique security number in black towards foot of stamp - prefixed A (½d), B (1d), C (2d), D (5d) or E (10d). Figure of value towards the centre at foot of stamp. 2011 (earliest recorded usage). Very similar to previous issue but altered inscriptions at foot of stamp, with figures of value now towards lower right-hand corner, and a more complex multicoloured security pattern in the background. Unique security number in black towards foot of stamp - prefixed A (½d), B (1d), C (2d), D (5d) or E (10d). Note: the second example of the 10d illustrated above has a slightly coarse impression and the security number is blank other than the initial letter. It may be a printer's proof but may also be a forgery. The forging of Kuwaiti revenue stamps was reported in the December 2012 edition of The Revenue Journal. Earliest recorded usage: July 2011 (5d), June 2012 (10d). The last four revenue issues of Kuwait were sold in sealed packs as shown here. c1997 issue in sealed packs. Kuwait Towers, with tallest tower at left. 2002 issue in sealed packs. Kuwait Towers, with tallest tower at right. 2009 issue in sealed packs. Stylised map of Kuwait with figure of value in lower centre. 2012 issue in sealed pack. Stylised map of Kuwait with figure of value at lower right. Note: the stamp illustrated on the outside of the pack is in fact the 1-dinar stamp from the previous issue. It is possible that a new pack will be introduced soon with an updated image. ?1960s. Emblems of thrift and productivity, with banner reading Bank of loans and savings. Inscribed Idkhar (=Savings) at top and Kuwait in Arabic below banner. 22½ x 26½ mm. Roulette 9. No watermark. ENSCHEDÉ imprint at foot. ?1960s. Similar type but Arabic inscription at lower right (FILS) redrawn, and without ENSCHEDÉ imprint. Roulette about 8. No watermark. ?1970s. Unidentified emblem, with banner as before. Inscribed State of Kuwait in Arabic at top and Idkhar (=Savings) below banner. 22 x 26 mm. Perf 13. 1947-50. Undenominated Post Office labels issued to commemorate the anniversary of Sheikh Ahmad Al-Jaber Al-Sabah's accession to the throne of Kuwait. Approx 25 x 38 mm. Inscribed Anniversary in English and Arabic, with dates indicating the year of the Sheikh's accession and the year of issue, all dates being shown according to both the Hijra and Western calendars. Perf 11 (P1), perf 11½ (P2), perf 12 (P3) or perf 12½ (P4). No wmk. 1. P2 shows the date of the Sheikh's accession as 1921, while the other three stamps show it as 1920. The actual accession date (according to Wikipedia, consulted May 2012) was 29th March 1921, and the significance of the year 1920 is not clear. 2. It is possible that the 1950 label (P4) was not issued since the Sheikh died on 29th January 1950, two months before the anniversary of his accession. ​3. P1 and P2 were printed in booklet panes of 6 (2 rows of 3), with margins at left, top and bottom. P4 is known in complete sheets of 20 (4 rows of 5 stamps each). ?1970s. University emblem. 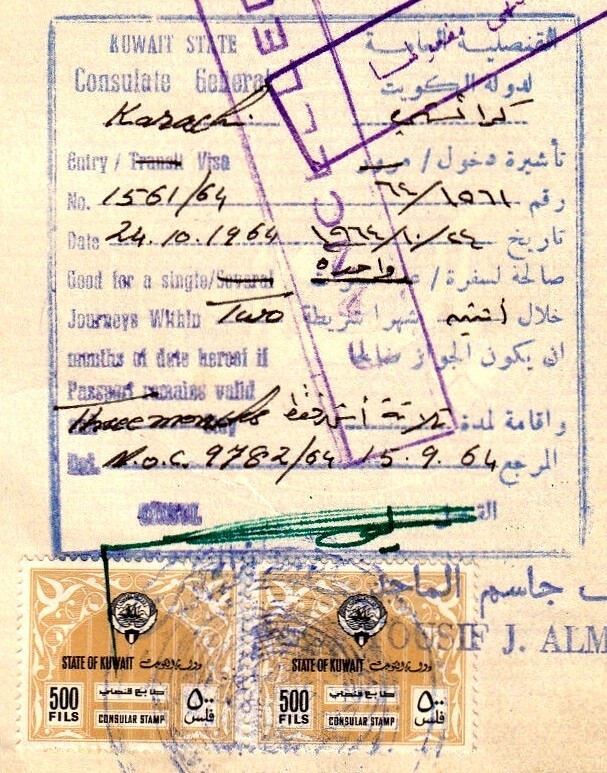 Inscribed State of Kuwait in Arabic at top.